The single sets the appropriate mood with a distinctively ominous string intro (which will likely make it stand out on the radio if radio plays it) as well as an evocative melody that lingers after the song ends. Melodic rises and dips convey angst-ridden indecision as Evans sings “Wheels are turnin’ in my mind… Don’t wanna leave, but I might this time,” and a dramatic crescendo exudes mounting desperation as the song launches into its chorus. Evans gives the song all she’s got, delivering a forceful performance of the chorus while rendering the song’s title phrase with a plaintive trill. Unfortunately, Evans’ and Mark Bright’s production is where things go wrong. During the chorus, Evans’ distinctive alto is needlessly marred by sea of pounding guitars. And, considering that Evans’ voice has always sounded best in a pure country setting, it is somewhat disheartening that little about “Slow Me Down” feels country. Though Evans’ style has shifted further toward the pop side of the pop-country spectrum in recent years, it has remained rare for her to release a single that features not so much as a trace of country instrumentation, as is the case here. “Slow Me Down” is a good song. It’s just unfortunate that it’s held back from being what it could have been. My only drawback is the wall of guitars. Other than that I am completely loving this. Especially her vocal. Haha, anyone else notice that her last album cover had the font from Taylor Swift’s “Fearless” album cover, and now the font on the cover for this single has the font from Carrie Underwood’s “Play On” album cover? Funny little thing I picked up on. Anyways, this review is spot on. This song could be better, but it’s certainly a very respectable effort. The lyrics are also pretty similar to Martina McBride’s “How Far.” Unfortunately for Sara, both Martina and Lorrie ended up with MUCH better songs. I thought that this song was atrocious. I could barely stand to listen the whole way through, with the production as obnoxious as it is. What focus group said that becoming a pseudo-arena rock artist was a good, marketable idea? What focus group said that to be successful you must production using loud electric guitars so that vocals are nearly drown out? Whatever focus group came to these conclusions has ruined country music and ruined this song. I’d like to hear what this song would sound like if it were arranged as a country song, not arena rock, then I might enjoy it. As it stands now, I do not. …pipes well wasted. this song is an odd mix of musical number and pop power-ballad drowned in a production overkill. trial and error remains sara evans’ middle name. this is a bit of both, yet has its moments – mostly in the first half. of course, the situation of leaving calls for some drama. still, she could easily take out some of the heat of this dilemma drill by just hanging around – say 5 to 15 minutes longer. perhaps, the perfect answering song would be conway’s “i’d love to lay down”. without the curler lines, though. Good review and I agree it could have been a good song. Makes me wonder about the recording process. Were the “pounding guitars” present the first time Sara sang the song? Did the producers feel that her alto was not strong enough to carry the chorus? What happened? I think it mostly just has to do with current industry trends, Bob. There seems to be a common line of thinking that the way to grab listeners’ attention is to make records as loud as possible, and Evans is far from the only artist affected by it. On records by artists like Blake Shelton, Miranda Lambert, and Carrie Underwood – who are certainly capable of carrying a song – I’ve often noticed similar problems. What focus group said that becoming a pseudo-arena rock artist was a good, marketable idea? What focus group said that to be successful you must production using loud electric guitars so that vocals are nearly drown out? Very good question Mike–and I don’t think you’d like the answer. It seems to me that over the last ten years, the industry has made what was a great music form into something super-imitative of the stale Southern arena rock of the 80s, in which much of the traditional country instrumentation gets buried under a wall of faux-Lynyrd Skynyrd electric guitars and big production ideas. And I’m afraid too many artists, Sara included, have fallen into that trap, whether by their own consent or not. Can Mark Bright take a fast train out of town?? You really have two groups of artists now. Those that are faux-Lynyrd Skynyrd and but there are also those that are faux-Tom Petty. Some artists, like Eric Church, cross over into both segments. And, outside of Church, what you get is mostly a mangled mess of sound, style and lyrics. I would hope that for the veteran artists like Sara Evans, it isn’t something they are consenting to, rather something they’re forced to do. I’m just waiting for a darn good group of artists who want to be faux-George (Strait or Jones, I’ll let you pick). Am I the only one who isn’t surprised by the sonic direction of “Slow Me Down?” Current rock trends aside, artists have been modifying their sound to fit radio forever. Kathy Mattea’s ‘Walking Away A Winner’ album from 1994 was in direct response to the trends of that era, as was Pam Tillis’ “Thunder & Roses” album from 2001. And we all know Reba has changed her sound more than once in a effort to stay current. It worked for Gary Allan with “Every Storm (Runs Out of Rain), too. 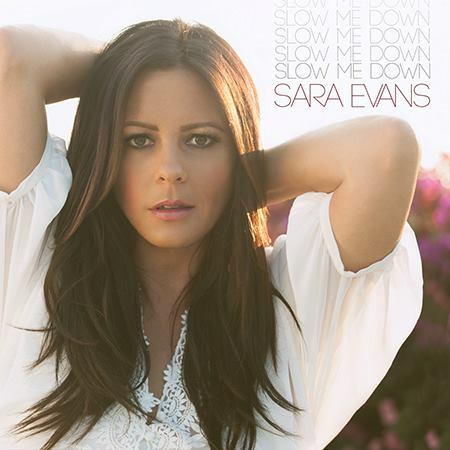 So, while I’m sad at the lack of country instrumentation on “Slow Me Down,” I’m not surprised that Sara Evans is pandering directly to radio in an effort to have more hit singles. Who knows if she could even get a “Suds In The Bucket” or “Born To Fly” up the charts these days. I doubt it. It’s more like finding artists who understand either of those two Georges’ music backgrounds and traditions. That kind of understanding of basic tradition, I think, is really lacking in a lot of what passes for country music these days.